I'm a sucker for English Focus Features that feel like Downton Abbey, so this one's right up my alley. As prelude, we saw some wonderful English trailers, from Breathe (Andrew Garfield) to Goodbye Christopher Robin (Domhnall Gleeson). 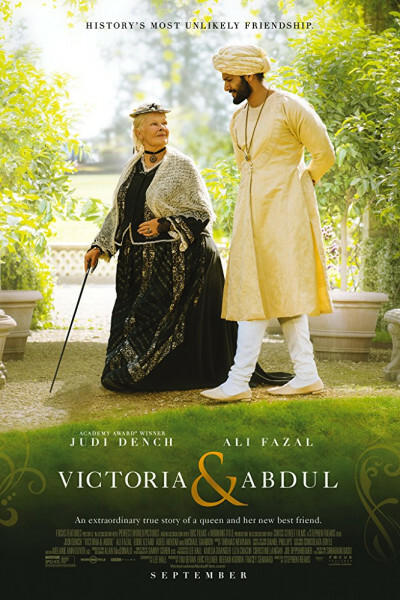 Victoria and Abdul is a story barely known because Abdul's personal papers were not discovered until 2010. And what a treasure trove they are. It's not a great film, per se, but it's a pleasant one, and we enjoyed it very much. Oh, with the exception of Bertie (Edward VII, King of England 1901-1910), played slitheringly by Eddie Izzard, and presented here as quite the abusive, jealous, petty, scheming, racist louse. Alas, his reign was short-lived, and there can be no protagonism without antagonism, so it is what it is.